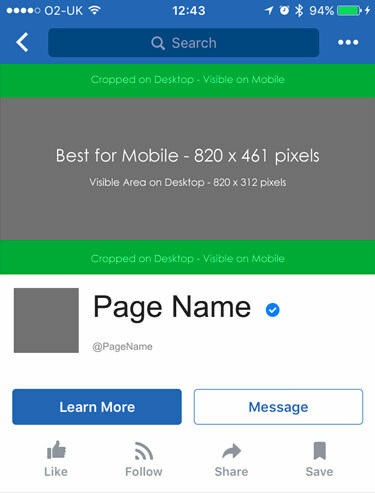 Since facebook had a slight redesign the actual size you should be now using for desktop is 820x312, however with this size you will find that when the image is displayed on mobile the sides are cropped off, 130px each side to be precise. To make sure that your mobile Cover will no longer have the sides cropped off you should set its dimension to 820x461, thats 461 pixels tall by 820 wide. The full image will then be displayed on mobile correctly but have 75 pixels top and bottom cropped off on desktop. However once you have uploaded your cover image into facebook you can adjust the cropping to your preffered position. One other thing to note is that it is best for you to save your cover photo as a PNG file and then upload it to facebook via the desktop, this will give the best end result once facebook has recompressed the image. Please download the template files below.